This is a fantastic book for all music lovers. It details the dance band era in the Luton and Dunstable area and contains some amazing photographs. If you're over the age of 40 you'll find memories of places long gone, along with some that disappeared before you were around. There are also some brilliant pictures of the California in there. 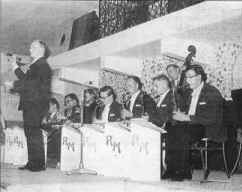 The picture above was taken when the Ray Miller Orchestra were on the large stage at the California. Immediately above you can see the railings at the front of the Vista bar. These disappeared in the late 60's early 70's when the stages were moved, resulting in one large stage under the Hillside bar. I'm told the stage was moved for two reasons. Firstly, bands kept complaining that drinkers threw beer cans at them in disapproval and secondly because artists kept hitting their heads on the concrete balcony supports. I suspect it was also due to amplification coming in and reducing the need for two stages as well as the problems caused by the acts having to fight their way through the crowd in order to get between the stage and the dressing room.